Microsoft is now ready to release their next update to the Windows Phone platform - Windows Phone 8.1 Update 1. The update will also include Lumia Denim customization for Lumia smartphones. This update has already been rolled out to those using the Preview for Developers program, but the update is now ready for general consumers. Cortana – The most personal digital assistant on the market will now be available in the UK and China as a Beta. India, Canada and Australia will have access to Cortana as a public Alpha. For US residents, Cortana now includes an improved natural language, car kit integration via Bluetooth for contacts, snooze reminders and calendar improvements. Live folders – If you prefer to keep your apps or games organised, you can now put them into folders. Simply press, hold and drag an app over another to create a new folder on the Start screen. Each folder can be renamed by tapping on the text field above the open folder. Apps Corner – Create a customised Start screen, where only specific apps or games are accessible. This could be particularly useful in the workplace if you’re issuing Windows Phones to employees. SMS merge and forwarding – Select individual text messages to either delete them out of a messaging thread, or to copy and past them into a new message in order to forward them. Consumer VPN – Maintain privacy and security when using data while connected to public Wi-Fi hotspots or even with your home Wi-Fi. Mobile Web Site improvements in IE – Connect and browse even faster with improved downloading speeds on mobile websites. Store Live Tile (US only) – The Store Live Tile displays featured apps and games that are the most popular in the Store, or most relevant for you. Besides the GDR1 update, Lumia users will also get unique Lumia experiences courtesy of the Lumia Denim update, which follows Lumia Cyan. Which was rolled out with Windows Phone 8.1 for Lumia handsets. 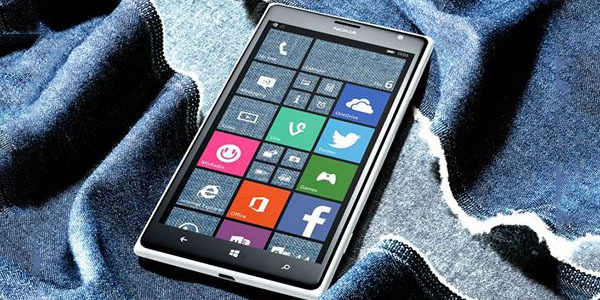 Lumia Denim brings the following new features and improvements to your Lumia device. Lumia Camera - The Lumia Camera is an update to the Nokia Camera, which offers several enhancements to the app. Speed - The camera app will be much faster, allowing you to capture photos more quickly, with only milliseconds between each shot. Moment Capture - When users long press the camera button, it will start capturing 4K-quality video at 24fps on your Lumia 930, Lumia Icon and Lumia 1520. Each frame will be captured at 8.3 megapixels, allowing you to save individual frames as high quality still images. Due to hardware differences, Lumia 830 shoots Moment Capture in Full HD, not 4K, and with reduced 2-megapixel per frame quality. Rich Capture - Auto HDR and Dynamic Flash will be available with Lumia Camera, allowing you to shoot first and adjust your camera setting latest for the perfect set of photos. Improved Algorithms - Microsoft has further improved the image processing algorithms on Lumia camera to ensure your device captures clear photos, even in low light. "Hey Cortana", Voice Activation - Those who own a Lumia 930, Lumia Icon or Lumia 1520 will be able to wake up Cortana by simply saying "Hey Cortana" while the phone is idle. This will activate Cortana allowing you to ask your personal assistant anything you want. This feature is made possible through the SensorCore technology, which is available on select Lumia devices. Glance Screen - Compatible Lumia devices will no show more at a glance with Bing Weather, or Bing Health & Fitness data, in addition to time and date, notifications and application data. Lumia Denim Update will ship with Lumia 830, Lumia 730 Dual SIM and Lumia 735. For all other Lumia Windows Phone 8 smartphones, the update will start rolling out during Q4 2014, following partner testing and approvals.